Robert A. Reed, Chief Machinist Mate, born Sept. 13, 1921, Fort Wayne, IN. 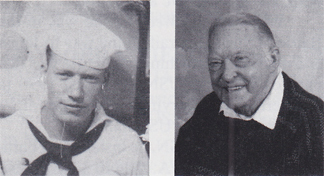 Enlisted in the USN in 1940; went to USNTS, Great Lakes; boarded USS West Virginia and shipped out for Hawaii in 1941. He was on R&R when he heard the first shots fired, and rushed back to the West Virginia to find his station in the fire room flooded and all his crewmates were dead. Stationed in USS Tennessee until ordered to USS Sicard, a minelayer, where he remained for the rest of the war, serving as fireman. Left for duty in Midway; March 1946 sent to USS Avery Island distillery plant where he observed the testing of the A-bomb. Served as chief machinist mate in January 1947 in the Pacific Reserve Fleet, San Diego; June 1948, put in the USS Fyles C. Fox in charge of the engine room. Spent the Korean War on the Fox escorting landing ships into the waters. Between 1952-58, he served as MMC on the USS Henry W. Tucker, Walker and Knox. Spent the remaining of his naval career at the US Naval Recruiting Station, Indianapolis, IN. Retired in 1960 and moved to Portland, OR. Began working as a maintenance engineer for Multnomah County where he spent 16 years before retiring in 1984. Since than, he has traveled and spends his time with his family and animals on his farm in Sandy, OR.